"Monday with Maxim: The Amazing Maltese" by Phylliss DelGreco, Jaclyn Roth et al. In "Monday with Maxim, The Amazing Maltese," Jessie is intent on training her neighbor’s dog, Maxim, to sit. She enthusiastically starts off the day using her imagined powers to transform an ordinary handkerchief into a magic scarf. Wrapping the scarf around Maxim’s neck, she begins the challenging—and sometimes futile—task of getting him to sit, with uproarious and surprising results. 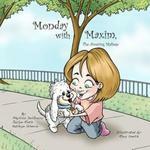 "Monday with Maxim, The Amazing Maltese" is the first book in The Jessie Books series, which offers an inspiring story for each day of the week, featuring a precocious little girl who lives with her two moms in Queens, New York. DelGreco, Phylliss; Roth, Jaclyn; and Silverio, Kathryn, "Monday with Maxim: The Amazing Maltese" (2011). DIVerse Families. 438.